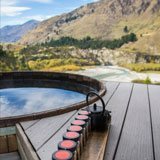 Onsen Hot Pools is located high on a cliffside overlooking the magnificent Shotover River canyon, providing views over breathtaking alpine scenery and the perfect vantage point to watch the Shotover Jet jetboats on the river below. Onsen Hot Pools are hot and steamy on snowy days, warm and sheltered on rainy days, cool and shady on sunny days, and simply magical in the evenings! Each pool room can accommodate up to four adults and are perfect for individuals, couples, families and friends. Water temperature is set according to the day – generally between 37.8C on a hot day, to 39.8C during a snow-storm. If you have a temperature preference, tell us when you book and your pool will be just right when you arrive! If you find yourself overheating, add cold water to your pool with the push of a button. A unique feature of Onsen Hot Pools are the retractable picture windows: Convert your pool room from indoor to outdoor and back again at the touch of a button!